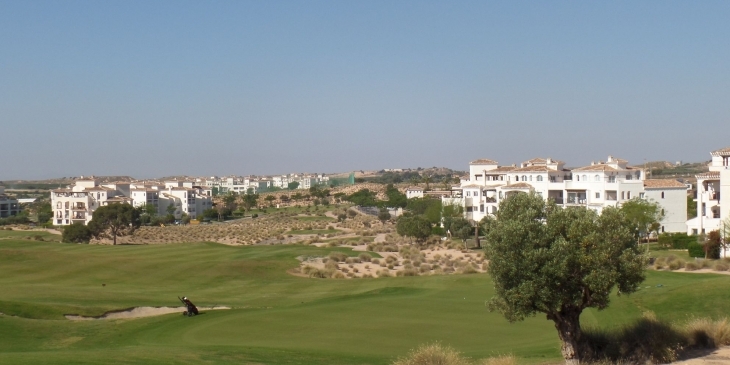 This lovely air conditioned two bedroom apartment on the Hacienda Riquelme golf resort is ideal for family or golfing holidays with views overlooking the large communal swimming pool and golf course. The apartment sleeps four and has a comfortable sized terrace which is ideal for outdoor eating in the morning or eevning. It is only ten minutes walk to the on site supermarket bar and restaurant, golf shop etc. The complex is just a short drive to the many blue flag beaches in the area and the local village of Sucina is just a 3 minute drive. The resort offers many children’s play areas an outside gym and games courts including tennis, 5 aside football, paddle tennis and basket ball court. The surrounding area offers both beauty and culture if you so wish.